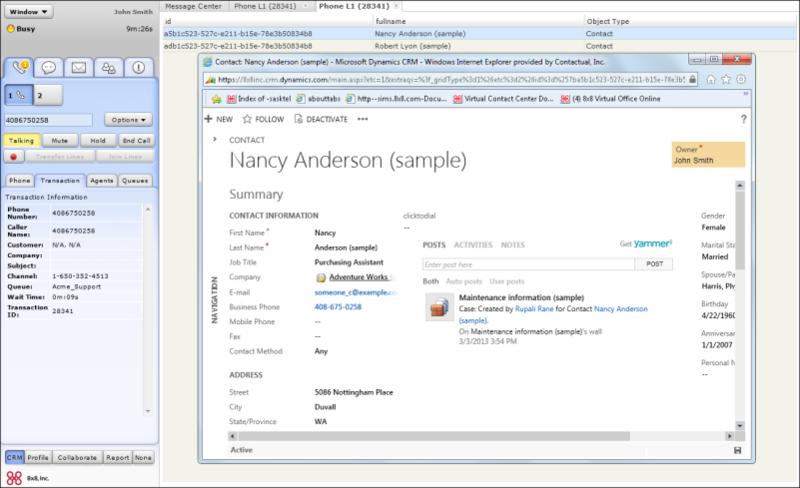 An agent must save the login credentials of the external CRM account in the agent’s profile. Integration enables searching for records with matching data, and popping the corresponding record(s) for specific events. Target Type The target CRM to integrate with CRM. Service Name The service name is the web address where your CRM is hosted; for example, AcmeJets.crm.dynamics.com . Branding URL The branding URL is the custom URL provided by CRM if you have customized your CRM to match your corporate domain’s look and feel; for example, support.acmejet.com instead of AcmeJets.crm.dynamics.com. Script URL This option instructs a tenant to execute a custom XML Microsoft Dynamics integration script using the specified script URL. If customization is enabled, the Script URL must contain a valid URL that points to the location of the custom script. Once the Script URL is specified and the screen pop page is saved, all the features and the functionality of the standard integration are replaced with the custom functionality. Agents see the changes with their next login. 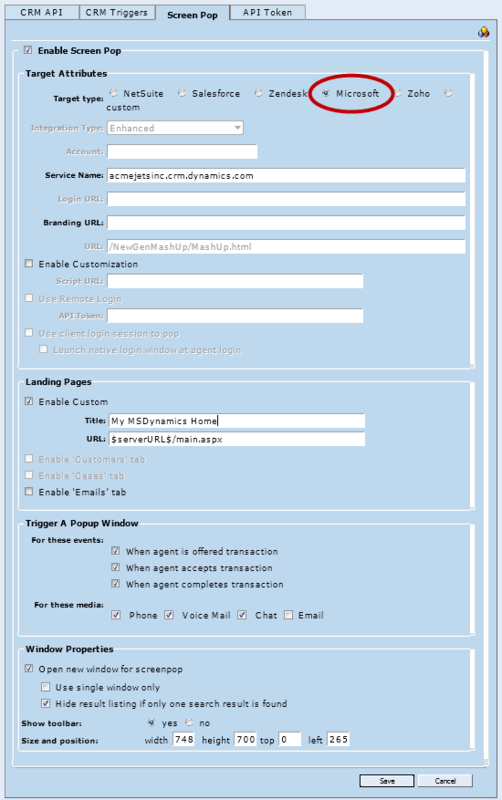 URL: The landing URL when an agent logs in to Agent Console, such as $serverURL$/main.aspx. This field is automatically populated with the home page of your CRM account. You can modify this link to point to your preferred page. A screen pop presents matching records and cases for existing records, or new records for new customers. Optionally, open a new window for screen pop, and specify its size and position. 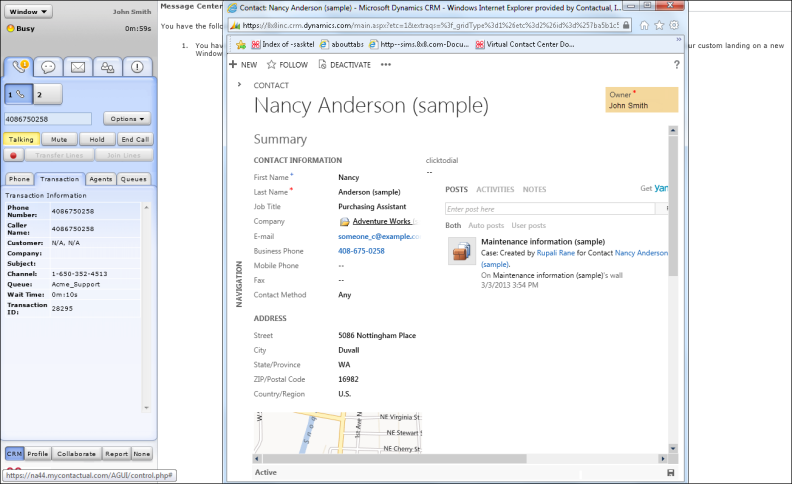 Open new window for screen pop This option allows agents to view screen pop of interactions in a stand-alone pop-up window instead of opening new tabs within Agent Console. If an interaction retrieves multiple matching records, the screen pop lists all matching records, and shows the details of the first record. You can click on any other listed record to view the record details. Use single window only: This option displays the screen pop in a new window and refreshes the same window to show every triggered screen pop. If the screen pop is triggered for multiple events, the window refreshes for each event. If disabled, launches screen in new windows for each triggered event. Hide result listing if only one search result is found: If an interaction fetches a single matching record, the screen pop hides the result listing and shows the record detail for the matching record only. If multiple records match, the screen pop lists all matching records, and shows the details of the first record in the list. Clicking on a record shows the record details. Note: Show toolbar is not supported in Internet Explorer 9.